Discussion in 'Silent Keys / Friends Remembered' started by K2HAT, Apr 16, 2019 at 2:12 AM. Jeweldeen (Deen) Brown, 96, of Oakdale, formerly of Niantic, passed away with family by his side on April 14, 2019 after a brief illness. Born in Schell City, Missouri, he was a son of the late Edward and Perl (Anderson) Brown. Mr. Brown was a man of quiet dignity, robust constitution, and fierce patriotism. He offered friend and acquaintance his quiet respect and it was returned in kind. He lived a full measure of life, and then some. A unique man from a sturdier era, will not see his like again. Loving husband, father, grandfather and great-grandfather, and faithful friend, mentor and shipmate to many, he will be sorely missed. In early 1941, he joined the U. S. Navy with the intention of becoming a battleship sailor. After completing Radioman school, he boarded a transport bound for Pearl Harbor arriving on December 11th only to see his ship, USS Nevada, sunk at the mouth of the harbor amidst the still smoking ruins. Having experienced a taste of submarine life in San Diego, he convinced a harried assignment officer that that’s where he should go. He was assigned to the USS Trout (SS 202); first assisted the crew in unloading twenty tons of gold and silver, the entire treasury of the government of the Philippines, that had been removed from the island to avoid its capture by the Japanese. Deen would go on eight war patrols on the Trout where he would be part of the Doolittle Raid, The Battle of Midway, the Battle of Peleliu, and several covert missions to Japanese-occupied Philippines. Deen was at an electronics training school when the Trout was lost with all hands. He would serve on the USS Gar (SS 206) for a final war patrol before being transferred to New London where he spent the duration of the war. 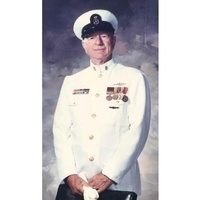 For his service he received the Submarine Combat Patrol Insignia with nine stars, Combat Action ribbon, a Navy Unit Commendation and three Presidential Unit Citations. He also was the proud recipient of a Secretary of the Navy Commendation for support of the Doolittle Raid on Tokyo. In 1958 he was promoted to Master Chief, one of the first in the Navy to be advanced to this newly created rank. After his Navy career Deen joined the Electric Boat division of General Dynamics and advanced to Chief of Electronic Systems Engineering. During his 24 years there he worked on new submarine designs with the Navy in Washington, D. C. and was a member of the industry committee formed by the National Security and Industrial Association (NSIA) to focus on protection of technology associated with undersea acoustical arrays. He retired from Electric Boat in 1987. In his retirement, Deen enjoyed maintaining his wooded property in Oakdale with his wife Lois, fixing tractors and small engines, and operating his HAM radio (call sign W1YH). He proudly carted many grandchildren and great grandchildren in his tractor wagon and hosted epic Easter egg hunts on their hillside. He leaves behind his loving wife of 71 years Lois (Walsh), his son Phillip of Quaker Hill, his daughters Lina (Dickey) of Shrewsbury, MA, Jessica (Hoadley) of Salem, 5 granddaughters, 7 great-grandchildren, and 2 great-great-grandchildren. He was predeceased by his brothers William of Yakima, WA and Roy and Edward of Nevada, MO and sisters Lorene (Lansing) of Pueblo, CO, Avis (Evans) and Revilla (Rousseau) of Yakima, WA. Calling hours will be Wednesday from 4:00 to 6:00pm at Byles-Groton Memorial Home, 310 Thames St.. Burial will be held with full military honors at the Veteran’s Cemetery in Middletown, CT on Thursday at 1:00pm. W1TRY and K1LKP like this. W5BIB and W1TRY like this.